DRESSING THE HAIR OF THE DEAD. A Professional Talks About Her Uncanny Occupation. Madame shrugged her handsome shoulders. Mrs Daffodil’s Aide-memoire: Mrs Daffodil does not have a high opinion of either the intelligence or the moral scruples of the repellent relatives who offered to sell the dead lady’s wig to the hairdresser. They might at least have dyed it so that it was less recognizable, or, more sensibly, taken it to a different coiffeuse, if they needed to offset funeral expenses. Wigs and chignons for the living were, however, often made of what was termed “dead hair,” or hair cut from corpses. These corpses might be unfortunates from the Workhouse or paupers destined for Potter’s Field; working girls of the streets, murderers or their victims. If not a black market, it was certainly sub-fusc. 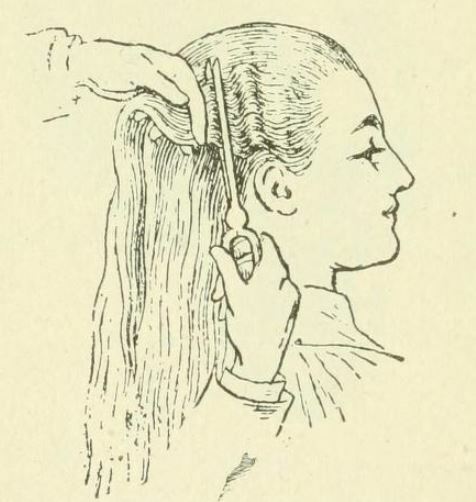 Medical men issued stern warnings about the diseases and insects that might be found in “dead hair,” and argued for prohibiting any hair except that from the living in hair-pieces. These warnings were widely ignored. In 1911, for example, hair from Chinese who died in the Manchurian plague, was being imported by Germany and England without so much as a murmur from the trade authorities. For more mortuary professions for ladies, please see this link, and this, about a lady undertaker. You will find more information on the popular and material culture of Victorian mourning in The Victorian Book of the Dead, by Chris Woodyard and under the “Mourning” tab on this blog. This entry was posted in Death, Fashion, Hair and Hair-dressing, Mourning, News and Announcements, Professions, Victorian and tagged cosmetic work on the dead, dressing the hair of the dead, Edwardian hairdressing, false hair, hairdresser, lady undertakers, mourning on February 5, 2016 by chriswoodyard.